Before Steve Jobs, there was Seymour Cray – father of the supercomputer and regarded as something close to a God in the circles he moved in. Jobs’ Apple Computer is reputed to have bought one of Seymour’s massive machines back in the day: a Cray, to design the brand-new Macintosh personal computer. This would have been a significant moment for a man of Jobs' character, not prone to flattering the inventions or ideas of others. In return, Cray is said to have quipped that he'd bought a Mac to design the next Cray. Cray – who would have been 90 years old this week – was the engineering brain behind a family of systems that broke ground in architecture and performance. 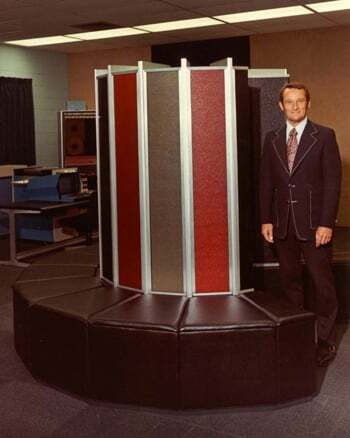 They broke new ground on price, too: Cray’s computers cost hundreds of thousands of dollars, with the Cray-1 weighing in at $8.8m – an estimated $34m in today’s money. This meant Crays could be afforded only by the top elite boffins in the arenas of science and the military, who used them to crunch vast models on weather prediction and the potential fallout from nuclear bombs. Such systems were out of the price range of even the biggest private firms. Irony, indeed, given Jobs’ collaborator Steve Wozniak built the Macintosh in order to democratise computing, as he told your correspondent back in 2011. Remarkably, and despite the price, it was Cray’s computers which dominated high-performance computing (HPC) for 30 years, seeing off even the mighty IBM. Buying a Cray became like buying IBM elsewhere: it wouldn't get you fired. It wasn’t until the 1990s and 2000s that rivals began loosening Cray's grip. It was IBM that drove home the nail with the watershed Roadrunner super, which was sold, significantly, to Cray’s very first customer – Los Alamos National Laboratory. Cray died following injuries sustained in a car crash in 1997, but he remains one of the most influential figures of 20th and 21st century computing. And far from being consigned to a dwindling historical niche or trampled by commodity cluster servers marching in lockstep, his supercomputer legacy is thriving. The US is now so worried that it’s slipping behind in the international supercomputer arms race that president Barack Obama issued an executive order in July telling his nation’s technologists to build the world’s fastest and most powerful supercomputer – one exaflop – by 2015. Executive orders carry the weight of law and move quickly, because they bypass US Congress. That’s because one nation has consistently topped the list of world’s biggest supers for the last two-and-a-half years: China, with its Tianhe-2, developed by the National University of Defense Technology and capable of 33.86 petaflops. So concerned is the US about China’s ascendance, that it stopped Intel shipping its high-end Xeon processors to China for use in the successor to that super – the Tianhe-2A, which is expected to hit 100 petaflops. Other chip manufacturers are also banned from sending their silicon to the increasingly nationalistic and sabre-rattling comrades of the Middle Kingdom. If the US thought this would slow down China, it thought wrong: China plans its own digital signal processors (DSPs) for Tianhe-2A, due in 2016. It’s all reminiscent of the early days of Cray in the 1970s and 1980s, when Cray’s eponymously named systems were for friends and Cold War allies only. Supercomputers were on a list of technologies whose export to foreign powers was tightly controlled by Washington DC. To obtain a super, any potential customer had to agree in advance to strict limitations on its use, to assist the US government in policing the use of the machine. In the mid-1980s, the CIA reckoned (PDF) that the purchase of a single Cray-1 could have doubled the total scientific computing power available to their ideological enemies in the USSR.